(CNN) -- World No. 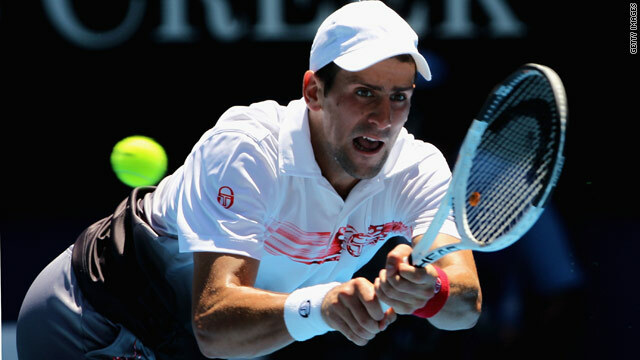 3 Novak Djokovic fended off an initial challenge from Marco Chiudinelli in the second round of the Australian Open on Thursday, then took control and cruised to a 3-6 6-1 6-1 6-3 win. "I was frustrated, especially at start of the match, because he was really giving it to me. He was very aggressive and stepping in and using every opportunity that has been given to him," Djokovic told australianopen.com after the match. "So automatically I just became too defensive and didn't really make too much. (I was) just waiting for his mistakes. That was a little issue there, but I managed to make that transition from being defensive to being offensive," added the third seed. In other play, Lleyton Hewitt (22) fought off unseeded American Donald Young 7-6 (7-3), 6-4, 6-1, while Nikolay Davydenko (6) swept aside Illya Marchenko 6-3, 6-3, 6-0. Spain's David Ferrer, the 17th seed, was downed by unseeded Marcos Baghdatis of Cyprus in a five-set battle, 4-6, 3-6, 7-6 (7-4), 6-3, 6-1. "In the beginning of the match I had a lot of chances to break him. I think I was the best one on the court. I didn't take any chances, and he did at 5-4. He took the set," Baghdatis told australianopen.com. In play on Wednesday, U.S. Open champion Juan Martin del Potro survived a tough battle with American James Blake, while defending champion Rafael Nadal cruised to an easy straight-sets victory. Seventh seed Andy Roddick, Britain's Andy Murray and World No. 12 Gael Monfils also made it through.